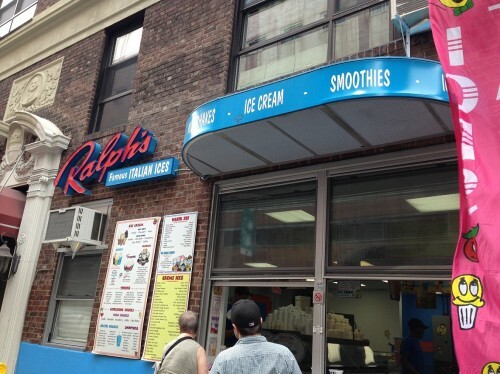 It we had a Flatiron Mid-Afternoon Snack column, Ralph’s Italian Ice would be featured there. Since we don’t and it is anyone’s guess how many warm afternoons we have left, I had to throw this one in now! I don’t know about you, but I normally associate Italian ice with a hot summer weekend beach day. But I shouldn’t discriminate. Why can’t it be a weekday mid-afternoon pick-me-up? It can. On a sign inside they have a list of an additional specials (11 more options on the day I went.) With so many options, if you aren’t sure about a flavor, you can ask for a mini spoonful taste. I bought a small ($3) cup of blood orange ice from the specials list. Isn’t blood orange an amazing summer flavor? It hit the spot on a warm weekday afternoon. Not too sweet or too tart – it was just right! Granted, there isn’t too much time left to enjoy Ralph’s. The earliest they might close is mid-October, but they might still be open into November, depending on the weather. They will announce on social media when they will close. Even more urgently, they will start to run out of flavors which they will not replenish. 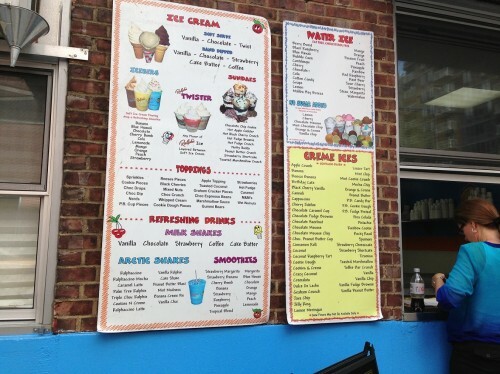 So if you want the full menu of almost 100 flavors available, you better go soon. If you are okay will coconut raspberry tart or rainbow cookie, then by all means, wait until October. 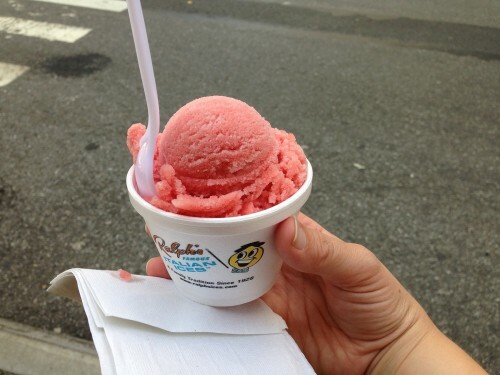 Italian Ices are synonymous with summer, and summer is happiness. So Italian Ices are happiness – my interpretation of transitive properties. It’s September already. Ralph’s is dead to me…at least until next summer. Posted by Sarah Zilinski at 10:00 am, September 6th, 2013 under Flatiron Lunch. Ralph’s closing on Graham Ave. was a super sad day for me. Loved loved loved that place. This writeup just brought the appetite right back. Small cup half coffee and half cannoli. Did you know you can do half and half for the same price? If you have kids (or even if you don’t) you know Ralphs. Putting it plainly, it is the best. Aside from serving a great product at a reasonable price, they have always been very supportive of the local community and schools.